Commentary: Backpacks That Save Lives? You Bet! Summer is winding down. Store shelves are stocked with notebooks and pencils instead of sunscreen and beach balls. And for most kids, the essential back-to-school purchase is the almighty backpack. If you’re going to carry books and lunch to school, you’d better have something durable — and fashionable! — strapped on your shoulders. You may be surprised to learn that a bunch of smart people working in global health have also been thinking about backpacks. 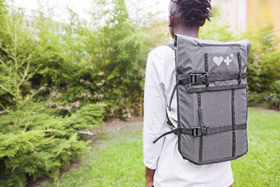 But they’ve been thinking about a different kind of backpack: bags and packs carried day in and day out by thousands of community health workers (CHWs) in developing countries, providing millions of children and families with basic health needs. In many parts of the developing world, access to health care can mean a twelve-hour walk to the closest facility. There are no back-to-school physicals, no infant check-ups, no skilled attendants at births. This is why governments and organizations are increasingly focused on how they can make health care accessible by supporting the training, supervision and support of community health workers who can deliver basic health care needs to those living far from traditional facilities. What is the identifiable trait for these heroes and heroines? It is a bag or backpack filled with life-saving medicines, diagnostics, and equipment to carry as they move from house to house. It is estimated that 6.9 million children under the age of five will die this year from entirely preventable causes. These deaths are especially tragic because basic life-saving interventions such as antibiotics, oral rehydration salts, immunizations, and insecticide-treated mosquito nets are affordable ways to prevent or treat the most common causes of child death: pneumonia, diarrhea and malaria. When some of these interventions are put into a bag strapped on the back of a trained and supervised community health worker, we’ve seen a decrease in child mortalities of over 25 percent. Here’s a great example: In Bangladesh, 50,000 children die every year from diarrhea. We know that simple oral rehydration salts can reduce mortality up to 93 percent, but only if they get into the hands of those who need them. Thanks to a recent community health worker program in Bangladesh, ORS coverage has reached 81 percent, saving the lives of thousands of children. One community health worker who could someday be empowered by the Backpack PLUS model is Rekha Bangarwa, a CHW in India, who has become an inspiration for her community. Despite initial disapproval from her family about taking a role outside the home, she volunteered to become a community health worker and has become a trusted and valuable source of advice and treatment. You can read more about Rekha on the REAL Awards website, which honors frontline health workers and the impact they have on communities around the globe. So much more needs to be done to fully capture the full potential of community health workers — they often lack supplies, require more training, need better integration into the rest of the health system, and would benefit from better incentives for doing their hard work. But we know that when all of this is done correctly, it works. CHWs are critical contributors in our final push to meet the Millennium Development Goals. The One Million Community Health Worker Campaign estimates that if interventions that integrate CHWs are expanded to maximum coverage, up to two million deaths per year could be averted in Sub-Saharan Africa. For millions of parents and children in the developing world, the glimpse of a backpack on a health worker is a sign of security, of hope, and the promise of a healthier child. Something we might all take for granted as we send our own children off to school. So this fall, when you are packing, unpacking, and packing again the books, binders, and bagels from your little one’s backpack, think about filling a backpack that will save lives.